A professional pratice where feet come first. We have been established for over 15 years and have built up a reputation based on our genuine passion for feet and their welfare! They are professional individuals that have trained and specialise in the treatment of foot conditions and associated Biomechanical dysfunction. Are all Chiropodists the same? Look for the letters S.R.Ch. following your Chiropodist name. Only HCPC Registered chiropodists may work within the N.H.S. and have undertaken and passed a 3/4 year degree level course at University. Only then can they obtain HCPC and membership of the Society Of Chiropodists and Podiatrists and operate but within strict guide lines. How can a Chiropodist help me? Almost everyone at some time has the unfortunate experience of Athletes Foot or Accute Tinea characterised by itchy skin especially between the toes and arch of the feet. The severity normally depends upon the organism involved and our general health and footwear. It can be caused by a variety of different fungi, though some bacteria can produce similar symptoms, it is often confused with skin conditions such as Eczema. There are many over the counter creams available that will quickly clear the condition. Occasionally infections can become quite debilitating and may require identification for the correct treatment approach. In such cases samples of skin or nail are used in a microscopy or laboratory analysis. Fungi, given an opportunity will also infect the toenails, often occurring following injury to the nail, they can however become established simply due a drop in our general health level. 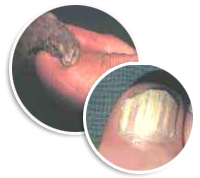 Visually, appearances range from superficial white patches to yellow streaking to crumbly discoloured and pungent distortions of the nail. Although not life threatening care should be exercised and good hygiene as finger nails can be also at risk of infection. A lab report is very useful as treatment regimes are more complex and lengthy requiring regular topical applications of solutions and sometimes oral medication. Nails are very hard plates, left with sharp or rough edges they will easily tear or penetrate the relatively fragile surrounding skin producing an Ingrowing Toenail condition. This can be an excruciatingly painful experience but in the right hands easy to resolve, treatment would involve advice on nail cutting and in difficult cases nail correction using painless nail bracing techniques. Often accompanied by infection there is always the risk if not professionally treated that a serious situation can arise. Less obviously Toenail injuries are easily sustained directly from sporting activities. Impacts or pressures can cause distortion in their growth which can be permanent and unsightly and leave them vulnerable to fungal infection both often needing regular professional attention. Bearing this in mind it is important to consider how the nails are trimmed. Some of us for instance diabetics are more vulnerable than others and complications can rapidly occur. Correct footwear for activities reduces risks in sports but ordinary footwear if poorly fitting can produce similar results over time. Sometimes it is advisable to remove permanently a section of nail to prevent re-occurrence. There are nail types that due to their shape are predisposed to creating discomfort or ingrowing. Verucae are a type of wart and there are numerous different types that can develop on our bodies but they usually prefer a particular area or type of skin. Verucae caused by Human Papilloma Virus (HPV) prefers the microscopically rugged skin of the feet and is spread following contact. Cells leave the surface of our bodies constantly, if one of these leaves the foot and carries the virus, it can be stepped on and spread to another part of the foot or to someone else. Usually our immune systems recognise the invasion and deal with it. Sometimes verrucae proliferate, and can become large and painful. If they do not naturally resolve over time or following simple treatments that can be obtained from a Pharmacist, professional attention is recommended. Various treatments are available from Homeopathic approaches to more traditional Caustic treatments (acid based), Cryosurgery (freezing) and less common, Electrosurgery and more recently microwave treatments. All have varying succes rates. This can be observed in the feet that take the brunt in the gradual formation of for instance of Bunions. Walking multiplies the weight through our feet several times and as in any imperfect structural design, functional damage and distortion will become evident. Improving the foot’s function using orthoses can minimise many different types of compensatory bony changes that can develop. During sporting activities the stresses acting through our feet increases many more times and these deleterious effects can be accelerated. Sports Injuries usually affect muscles and ligaments in the feet and legs occurring quite suddenly or quickly following exercise. Shin splints associated with function is one fairly common example which responds well to the use of orthoses. 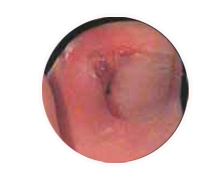 A partial nail avulsion (P.N.A), is a highly successful simple operation under local anaesthetic and provides permanent modification of the nail and lasting relief. Callous or hard skin is a natural phenomenom, its an excessive accumulation of dead skin cells usually where there is excessive pressure or friction. Often found on the floor of the foot but also it can be found on and even between the toes but it would be found any where for instance on ones elbows or knees if there was excessive use of these areas. Commonly, underlying the callous bone feels particularly superficial and at these points the bodies weight becomes concentrated and the callous is super hardened into corns which can feel like a piece of grit or a small stone. The weight bearing bones of the feet are not always exactly on the same level, that’s why these pressure points can develop. Treatment, involves taking into account this abnormal situation and applying Biomechanics and the removal of corns and callouses to relieve the discomfort during walking. Often the strain involved in avoiding these pressure points whilst walking generates strains and stresses elsewhere and the posture suffers. Self help in the form of applying foot creams regularly will soften and lubricate the hard skin, but its best to consult a HCPC (Health Care Professional Council) Registered Chiropodist/Podiatrst before the situation becomes advanced and painful. Simply explained a Podiatrist applies the science of Biomechanics when treating his patients. Researchers discovered that many of us inherit feet that have slight defects that can generate for instance callouses in normal use or function. They also found that this defective function can affect our leg bones, joints and muscles, even the back and our general posture. Understanding how this occurs and treating such conditions requires specialist knowledge, in which a Podiatrist has trained. 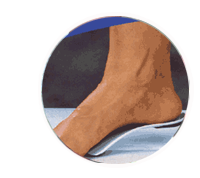 A Podiatrist can perform a Biomechanical assessment, an examination of the foot and leg bone architecture and function and provide shoe inserts, Orthoses that help neutralise the abnormal stresses. Over the course of many years to adulthood and beyond the effects to our bodies can amount to what is commonly termed “wear and tear”. If in doubt consult a podiatrist or physiotherapist.